While Seeburg was secretly developing the "M-100A" that would be introduced in December of 1948, they continued using a very dependable 20 selection sliding tray mechanism. It was tried and true having been used in all Seeburgs since the end of 1937. The "1-47" model had slightly different coloring then the "1-46" the year before. It even had the basic, yet unique, selection buttons that all Seeburgs had been using since 1941. The paper title strip was back lighted and magnified. So instead of needing to look away to press a button after choosing a tune, the title strip was the button. Very cool! The first two of this series were made of wood while the "1-48" was completely aluminum. Admittedly we've not reconditioned a lot of this series of Seeburgs in recent years, but I can't imagine the aluminum cabinet could sound any where near as good as a wooden one. I mean, when was the last time you purchased a pair of floor standing speakers made of aluminum? In the last few years we've accumulated a few of these "Trashcans", but we just hadn't gotten around to doing one of them. I DO know that I'll be setting one aside for myself. I think they are very cool besides looking like R2 D2 or a pedal actuated kitchen trashcan from the '50s. You buy one of these lovely light-ups and we'll recondition both yours and mine at the same time. Deal? 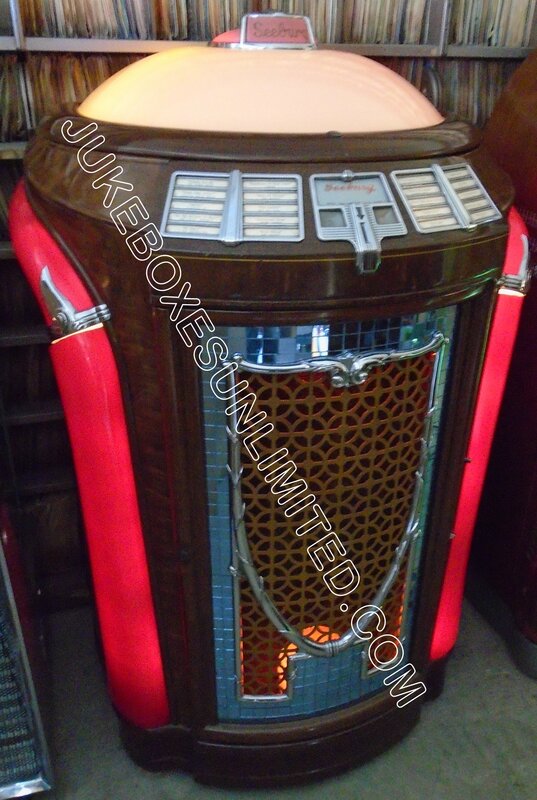 This will be a professionally rebuilt/restored 1947 Seeburg 78 - RPM jukebox model "1-47" "Symphonola" with SN: (pending) from JUKEBOXES UNLIMITED ®/Los Angeles. This jukebox comes with a full one year parts warranty, excluding transportation. This jukebox is not perfect and may have blemishes and cosmetic distractions not visible in the accompanying photos.